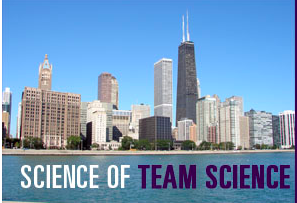 The second day of the Science of Team science conference wrapped up. This post muses aloud about why team science might be here to stay and how it may serve as the ideal response to practicing research on wicked problems in a complex world. Day two of the Science of Team Science Conference wrapped up yesterday with a lot of energy and enthusiasm (plus some anticipation at today’s 1/2 day workshop on social network analysis). The tell-tale sign that the conference was a hit was the observation that nearly 4/5 of the room was full to hear the convener provide general closing remarks on a Friday afternoon (this after 20 hours of sitting in a hotel ballroom for two days). That speaks volumes about the conference and how much interest there is in the topic. It is perhaps because of this interest that there is genuine hope that something will come from this beyond just another conference. The question I asked myself is: Why did this conference and this topic yield such interest and a positive response? What is it about teams that makes this such a compelling issue? 1. Teams fit our basic need for human relatedness. As the barrier between work and the rest of life (ROL) dissolves further due to changing job structures, information technology, and human mobility the potential to become isolated is high. The gap between connection and community is enormous. We have ‘friends’ on Facebook, ‘followers’ on Twitter, and ‘connections’ on LinkedIn, yet of these many dozens or hundreds only a few really count. Of those, even fewer are ones that we can comfortably relate to. Yet, this appearance of hyperconnectedness provides a false sense of relationships and transmits into a remarkable leveling off of human experience (see Jaron Lanier‘s You Are Not a Gadget, discussed here). David Whyte’s Crossing the Unknown Sea , Parker Palmer’s A Hidden Wholeness, or Meg Wheatley’s Turning to One Another are works that do a wonderful job of pointing to this problem of disconnection in work and argue for greater integration between one’s personal and spiritual life and their vocation. Seth Godin’s Linchpin (discussed in previous posts) is another book that illustrates the power of bringing one’s “art” to work with others. Science has traditionally been the domain of individual effort, working in small groups at best, but generally alone. This is isolating in itself, but add to the myriad other factors that foster isolation in modern scientific work it is not surprising that any avenue to build connections to others, while continuing to do the work that scientists love, has been embraced. 2. Teams confer genuine advantages in terms of productivity and outcomes. The conference offered a blend of theory, research and strategy, which is probably why it had such broad appeal to an audience that comprised people interested in all three of those things. When the focus was on evidence, it became clear that there is an emergent literature on team science impact. Team science is not a panacea, but it is effective for certain types of problems and provides an alternative option for those wishing to do research, stay social, and tackle complex, wicked problems. Some of the data presented in panels or posters points to teams being more successful at getting large grants, and that, for some, team science can boost productivity. Much more research is needed, but the early results are promising. Conceptually, this makes sense. Diverse teams of individuals will see problems differently and, particularly with complex problems, complex responses are necessary and diversity provides this complexity. Teams are an ideal structure to addressing a problem that requires new ways of working, knowledge from many areas, and a method of coordinating that knowledge in order to mobilize it. 3. Team science is becoming “hot”. This is the more cynical perspective, but it nonetheless describes reasons why people pursue fields of inquiry. In recent years the creation of funding structures from the National Institutes of Health and National Science Foundation in the U.S. has led a lot of people to consider team science simply as a mechanism to raise research funding. This conference is a byproduct of those decisions. This is not to say that those who pursue team science funding are doing it just because of the money, but it is a powerful incentive. Research flourishes where there are resources to sustain it. It draws in researchers, attracts graduate students and post-docs, and shapes the way many create proposals. Last night over dinner, a group of us discussed the role that financing plays and whether teams that come together because they want to work together and are looking for funding to support that function differently than those that come together to get funding and then do research based on the details of that grant. Like the conference as a whole, the responses were diverse and no agreement on what would work and why was made. Nor was one expected. The conference organizers have proclaimed that this is the first annual event, which will mean that we have an opportunity to see where this goes and what a year will do to shaping this field. The conference website is going to be transformed into a community website, enabling researchers, practitioners and policy makers to interact and even create teams. Whether they form based on personal interest, whether we need a ‘coach’ or two, or whether there will be funding to draw people in remains to be seen. For readers looking for another take on the conference and some insightful reflections on what was discussed, I’d encourage you to visit Stephanie Jo Kent’s Reflexivity blog and read the play-by-play comments on Twitter by searching the hashtag #teamsci10.